Alright, let’s get this show on the road. Mission statement is here in case anyone wants to know the goals behind this. 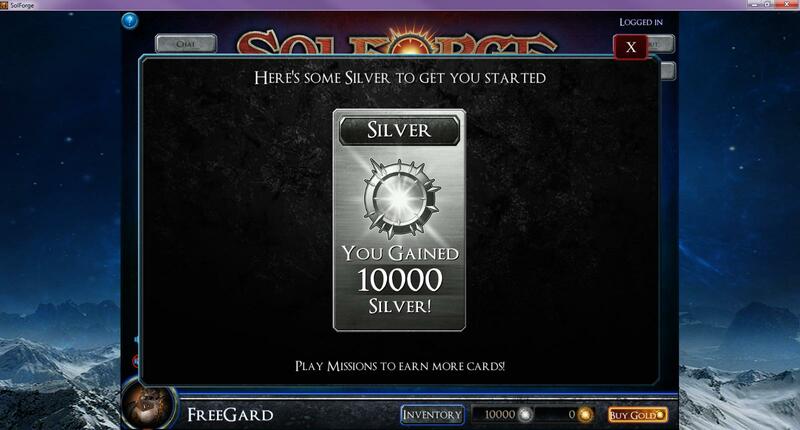 When you start out your Solforge adventure, you are given 10,000 Silver. That is enough for half an event ticket and not much else. For now, I will keep it towards forging. 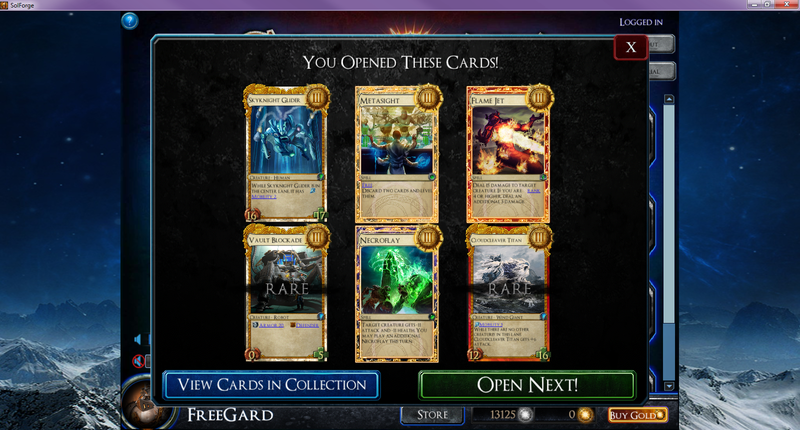 As for the starting collection, it is too large to screencap, but you are given four different starter decks, one for each faction. 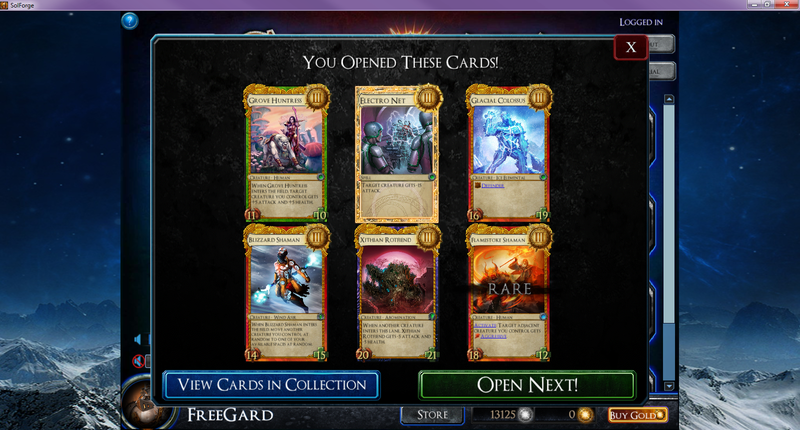 Each contains 2 Heroics, 5 Rares, and a smattering of commons. Notables are Scrapforge Titan, Epidemic, Lifeblood Dryad, and Ferocious Roar. Everything else is variations of mediocre. So what I want to do first is the same thing I imagine what most new Players will be told to do when they first start Solforge – The Campaign. 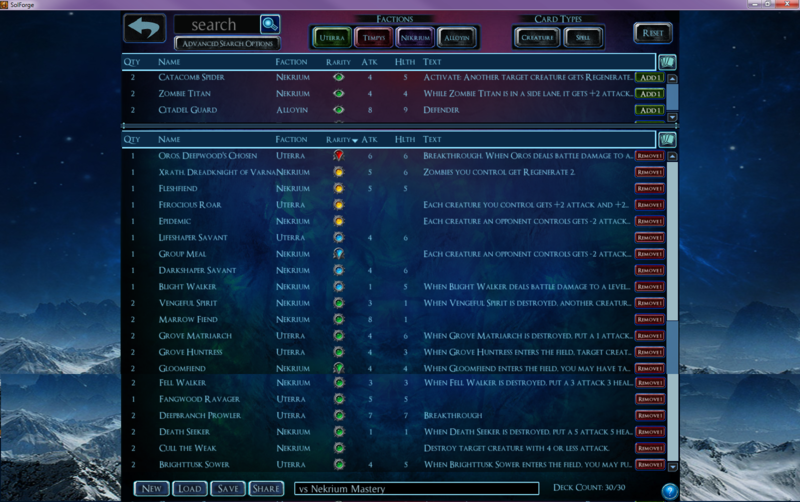 As of the time I’m writing this, the Campaign mode is pretty barebones. There are the four “[Faction] Initiate” missions, which act as tutorials for new players, plus the 3 Herald quests. The Faction missions are all very simple missions; the AI plays underpowered cards and your helpful guide explains to you the various mechanics of Solforge (discarding your hand at the end of turn, leveling up, and card-specific mechanics like Aggressive and Armor). All very simple stuff. You are forced to use a tutorial deck, which matches the four basic decks given to you at the start. Of the four cards, both Uranti Warlord and Uterradon Rex see some competitive play. Though, at this point, I’ll likely throw any of them in any deck I make that fits their factions. I’ll open the booster packs at the end of the day. The next four quests, the Mastery missions, are a little more challenging, but still doable with the cards you are given. Luckily, the difficulty doesn’t scale that much between the missions, with the exception of Tempys Mastery being much harder than the other three. I’ll outline the strategies I used for each below. – Oros’s creatures have lifelink (they heal Oros equal to the damage they deal). – Problem cards: Arboris, Runebark Guardian. These guys get large fast. – Oros summons himself as a rank 4 card at the beginning of Rank 4. Beat him before then. – Played Nekrium/Tempys against it. The aggressive, high-power creatures allow me to kill Runebark Guardian early, and let me deal with Oros’s life total before it gets over 100 for Arboris. Wind Primordials are particularly good in this deck. – There is a permanent No Mercy in effect; if you hit Cercee’s life total with a creature, that creature dies. 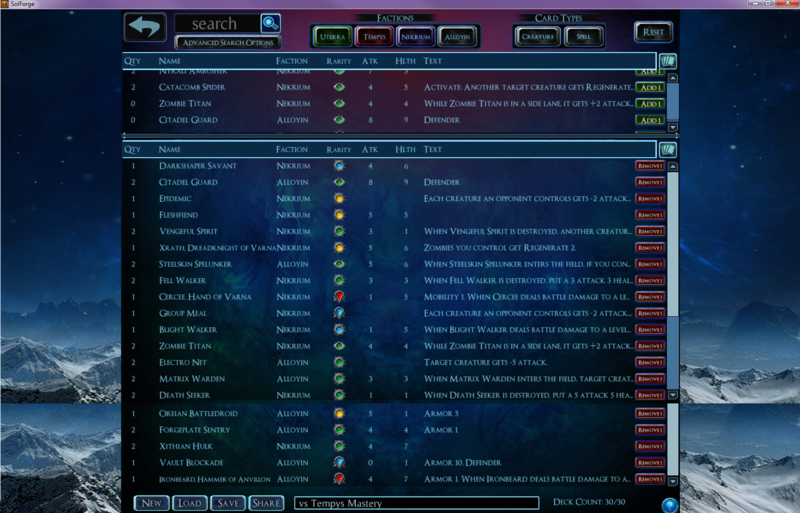 – Cercee summons herself at the beginning of Rank 4 (if she has room). – Cercee plays A LOT of Ossuary Spirits. Debuffing them is the key to winning, since she won’t replace her creatures. – Played Uterra/Nekrium. Put an emphasis on the Gloomfiend/Vengeful Spirits to make Ossuary Spirits useless. The other creatures in the deck either make creatures, replace themselves (so they can die to Cercee’s passive effect), or are Oros (gigantic creature with Breakthrough). – Ironbeard’s creatures have +2 Attack. 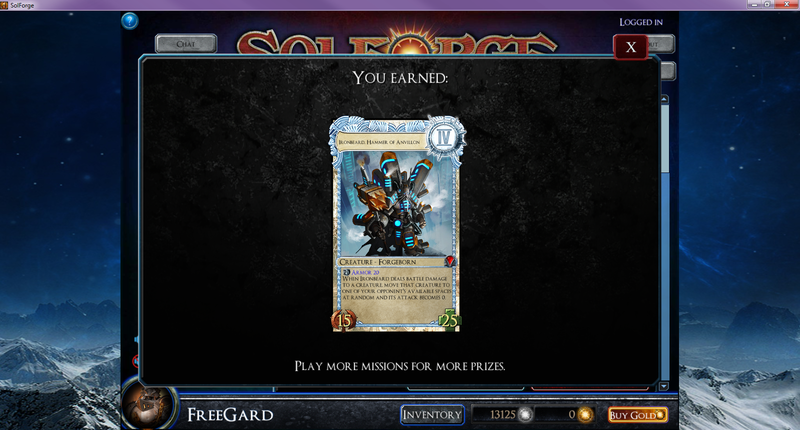 – If you do not put creatures in front of his creatures, he summons a 1/1 Soldier to block it (3/1 with the buff). This doesn’t apply to summons like Brighttusk Sower’s seedling. – I assume he also summons himself at the beginning of Rank 4, but his passive isn’t strong enough to make up for that he is playing bad Alloyin cards. Ironbeard never made it to Rank 4 against me. 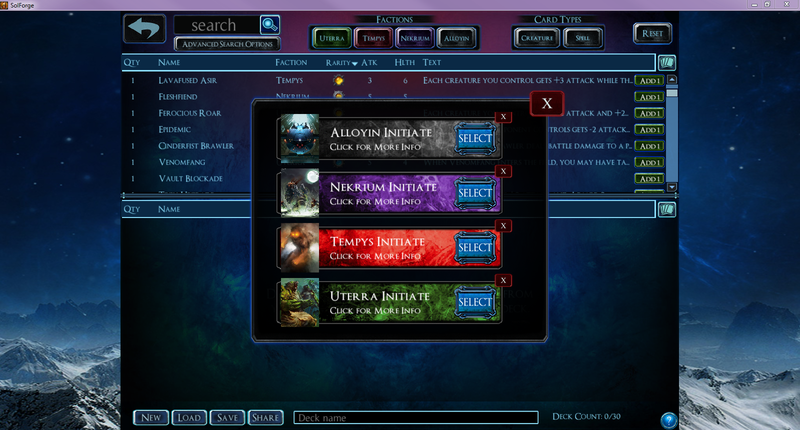 – I used the same Uterra/Nekrium deck that I used against Cercee. – This along with crap like Ash Maiden and Ashurian Brawler make this Campaign mission quite difficult and very snowbally. – Korok is always in the center lane; he will replace any creature that is already there. 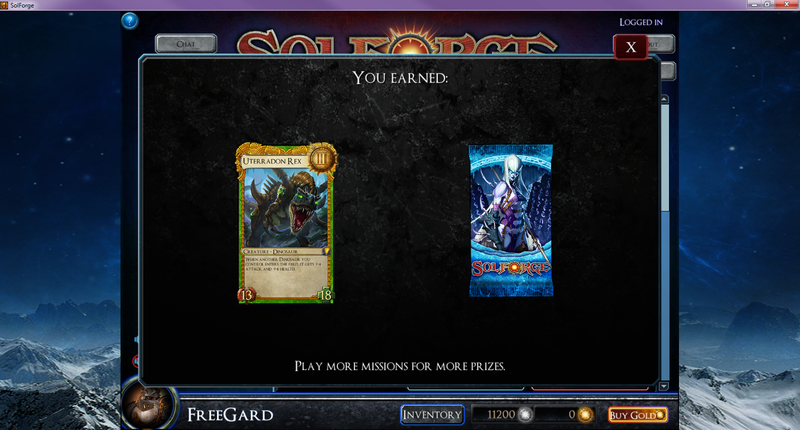 – Used an Nekrium/Alloyin deck. Priority on Citadel Guard and creatures that can survive combat. Shrinking Korok also has some merit, but even if his attack is 0, he still gives creatures Aggressive and summons a new version of himself at the beginning of the rank. That’s enough for today. I remember the second set of challenges being much harder, the ones where the rewards are the Imprisoned Heralds artifacts (Scythe of Chiron, etc). I want to wait until I have more cards to work with before tackling them. 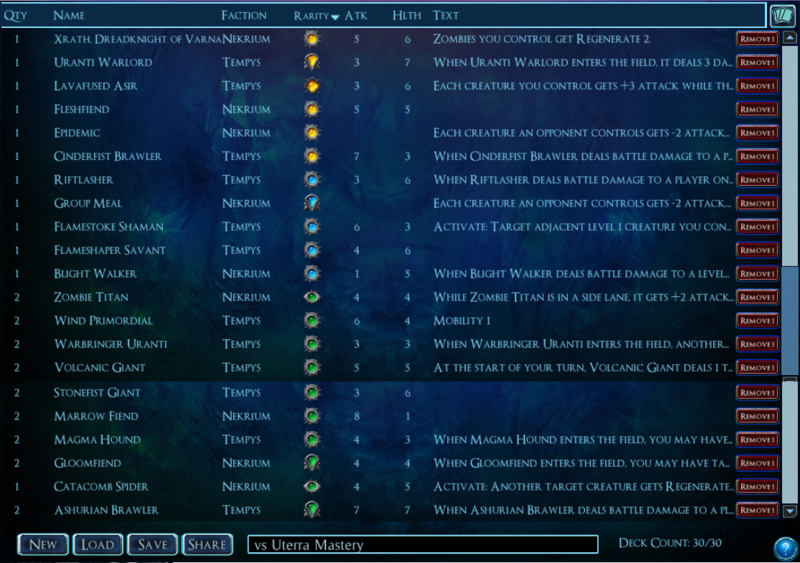 Plus, I may just do those one day at a time instead of all at once like I did these tutorial missions. Well, no player opponents yet, but that’s pretty expected – not enough tickets to draft yet. 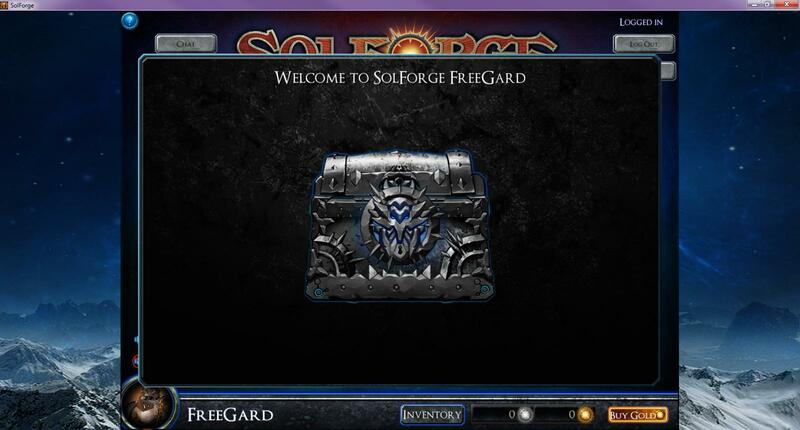 I imagine the first couple days of Solforging is going to be pretty lucrative, with the Campaign rewards on top of the 10 wins Legendary Chest. 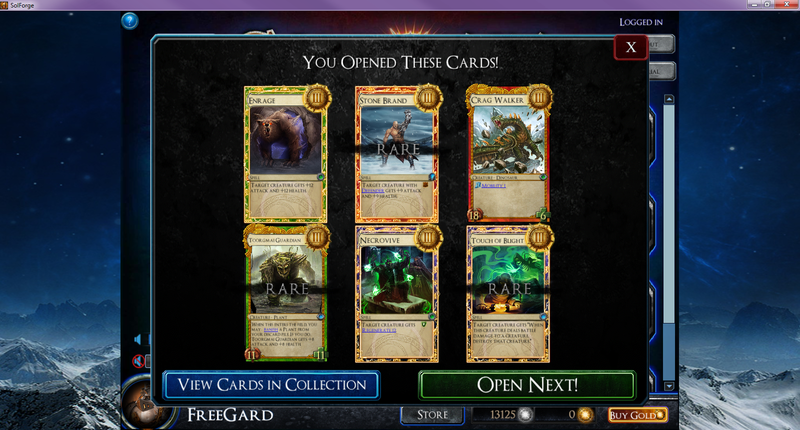 Overall, that’s 13 rares. 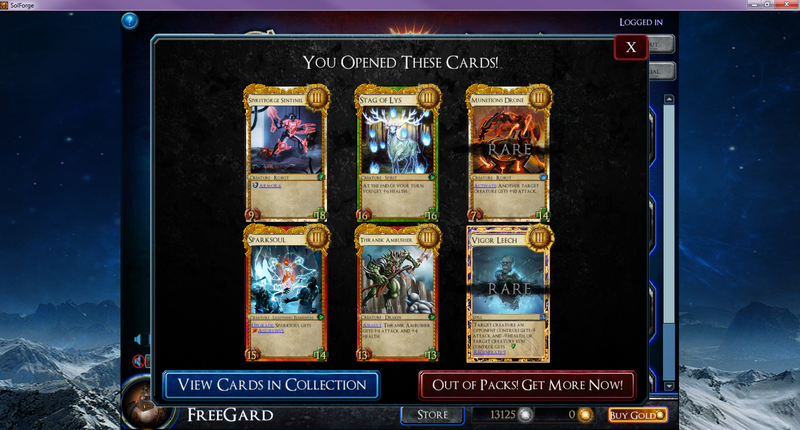 Not bad, considering you are only guaranteed 1 per pack and I averaged 2 per pack. However, with none of the cards being competitive-playable (even in budget lists), they are more towards building my collection for Forging than anything else.